Cyclades AlterPath Integrator (API0003) for HP OpenView is the first out-of-band infrastructure (OOBI) integration module that links the AlterPath System to the HP OpenView systems management platform. The AlterPath Integrator allows IT administrators to securely access, diagnose and restore disconnected IT assets using Cyclades OOBI products (serial console, KVM over IP, power control appliances, service processor managers and server blades) from within their HP OpenView window. The AlterPath Integrator eliminates the need for two separate management consoles by providing a single interface to manage IT devices either through the production network or the OOBI network. Using the integration module, administrators can right-click on disconnected IT asset icons, which appear in red instead of their normal color within the HP OpenView Network Node Manager (NNM). This action opens a direct out-of-band connection to the disconnected asset through the AlterPath System and allows the administrator to quickly diagnose and restore the asset. By streamlining this process of restoring IT assets, the Cyclades AlterPath Integrator (API0003) reduces the complexity of administering multiple management systems and enables businesses to reduce operational costs and risk, while increasing IT personnel and IT asset productivity. Cyclades AlterPath Integrator (API0003) Synchronization: The Cyclades AlterPath Integrator (API0003) provides a mechanism to automatically import HP OpenView node maps through file transfers (using the HTTP protocol and industryaccepted XML data file structure) initiated by the integration module at predefined intervals and when the program starts. Cyclades AlterPath Integrator (API0003) External Interface: An external interface is designed to allow theintegration module to launch a Web browser session to the AlterPath Manager. A URL is provided for each console and action that allows direct access (after proper authentication) to that particular console and action. 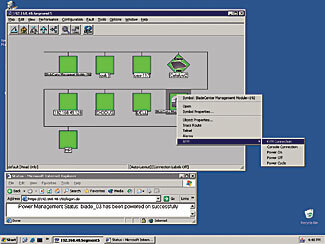 Diagram 1: View of HP OpenView NNM management interface. 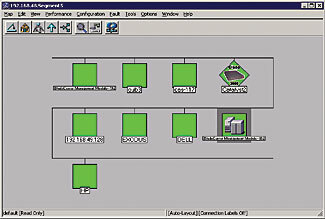 Diagram 2: View of the AlterPath System management interface. Diagram 3: Consolidated view of HP OpenView NNM management interface and the AlterPath Integrator. 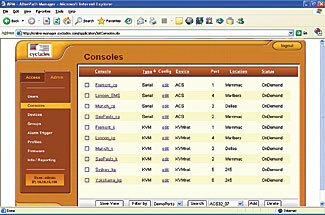 Screenshot shows the pull-down menu for remote access to a server with the following action choices: KVM Connection, Console Connection, Power On, etc. The lower-left dialog box shows the message received from the AlterPath System confirming the action taken.